The post office is rapidly turning into a one-stop shop for me. It has gone beyond a place you go to for the the usual franking of mail to a place where you can pay your bills, renew your passport (if you're Singaporean), and even shop. 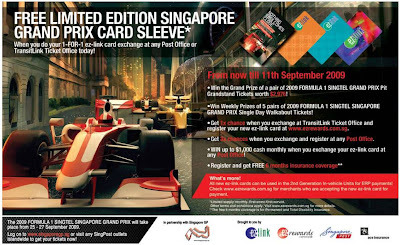 I recently found out that you could also get free limited edition Singapore Grand Prix Card sleeves if you exchange your old ez-link card at the post office. Way cool. Promo's good until Sept 11, 2009 only. 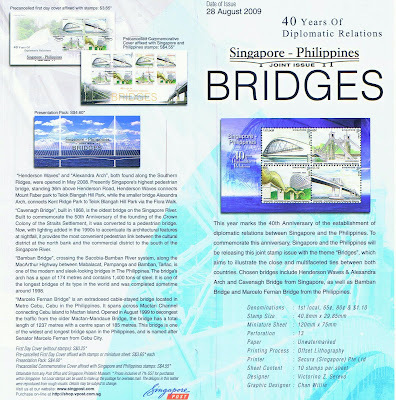 Oh, and while there, you might want to get a first day stamp issue of "Bridges" which commemorates the 40th Anniversary of the establishment of diplomatic relations between Singapore and the Philippines. This will be issued on Aug 28 and may be purchased for less than S$5 at any Post Office and the Singapore Philatelic Museum.